Nasa's Deep Impact spacecraft may have missed its chance to see the crater made in Comet Tempel 1 because of the large plume of material kicked out. Seeing the crater was a key objective of the mission - scientists hoped the impact depression would tell them more about the structure of the comet. But the team can use indirect methods to estimate the crater's dimensions. A 370kg "impactor" released into Tempel 1's path by the flyby spacecraft crashed into the comet on Monday. "They can calculate the volume of material thrown out and that gives them a basic idea of the crater volume," Dr Paul Roche, director of the UK-run Faulkes Telescope in Hawaii, told the BBC News website. Using a best estimate of the hardness of Tempel 1's surface, scientists can calculate a rough depth and radius for the crater. But, said Dr Roche, "it's not as nice as seeing and measuring the crater itself". The US space agency (Nasa) might yet be able to resolve part of the crater using image processing software, he added. Scientists had planned to study the depression to determine the strength and structure of material on the comet's surface and immediately below. The type of crater formed could have helped determine whether Tempel 1 was composed of relatively porous, pristine material or stronger, processed material. 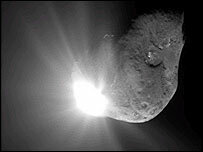 This would give clues to how comets formed and evolved. Regardless, the mission will give scientists heaps of data to trawl through. And the plume itself will provide valuable information on the composition of the cometary material. 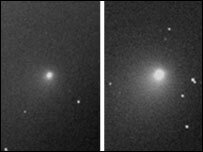 Dr Roche's team at the Faulkes Telescope has been tracking the intensity of the comet before and since Monday's impact. "There is still material gushing out of the crater right now; Tempel 1 is still brighter than it was before impact. If the hole is deep enough, material could keep flooding out for weeks or months," he said. "We saw a brightening and fading within the course of an hour-and-a-half to two hours." School children from Hawaii, Iceland and the UK have been involved in processing the images.